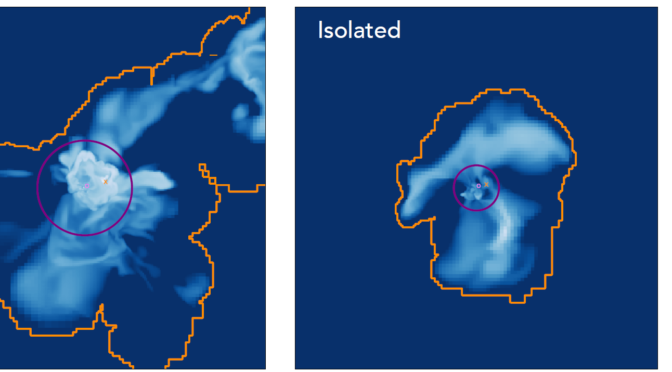 Earlier this month, our paper (arXiv) on the chemical enrichment of the first galaxies and their connection to local ultra-faint dwarf galaxies was accepted to MNRAS. This paper was led by JHU postdoctoral researcher Lauren Corlies. We compared the average metallicities of both simulated and actual galaxies to determine how and when they were enriched, in particular if Population III (metal-free) stars imprinted on them. We also explored an analytical model of metal enrichment (i.e. blastwave evolution) that matched the simulation data to a reasonable degree. 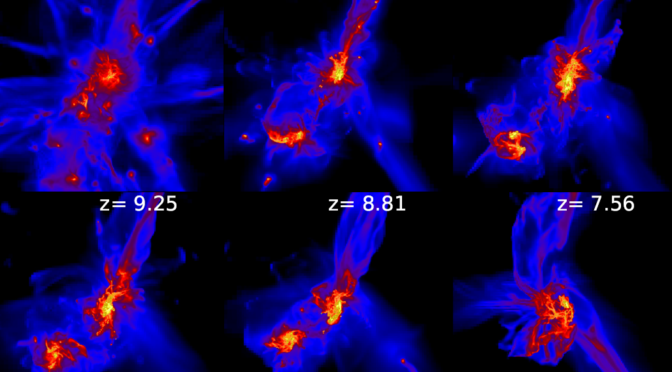 We found that the simulation produced metallicity distributions in single galaxies that are narrower than the data, and future work is needed to address this inconsistency in simulations of low-mass galaxies. Today we submitted a paper (arXiv) that follows the growth of a massive black hole seed in the early universe. We found that supernova explosions heat and stir up the gas inside the gas, preventing the central black hole to accrete and grow rapidly. Stars form at rates 10,000 to 100,000 times faster than the black hole grows. The main galaxy has a stellar mass of 1 billion solar masses, which totally outshines the central black hole. This could explain why there is a lack of faint AGN at high-redshift where these more “normal” massive black holes aren’t accreting very rapidly and cannot be detected with current telescopes.